Hide treats inside the Treat Maze to start the game. Treats can be found by turning the Treat Maze around and around. The game provides fun entertainment for dog and owner. The Dog treat Maze is a game that will entertain your dog while making them work for treats and can be used both indoors and outdoors. To start the game, place treats inside the maze through the opening in the top and the bottom. Treats will start falling out at random when your pet starts to play with it. Rocking, moving and turning the Dog Treat Maze moves the treats through the maze in the centre of the game until they fall out unexpectedly through one of the openings. The unpredictability of the game keeps it challenging for your dog. The difficulty level of the Dog Treat Maze is level 2. Please look here for more information about the games of Nina Ottosson. Please note: This game is suitable for all dogs, regardless of age, breed and size. Make sure that this game is always given under constant supervision. 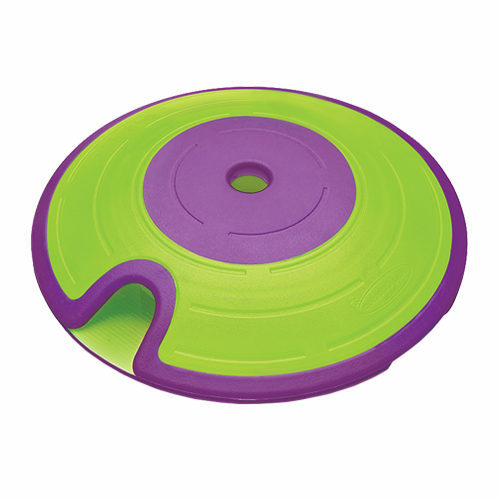 The Treat Maze is made of recycled plastic, which can easily be cleaned with water and soap, and is dishwasher-safe. Make sure there is no soap left in the game before giving it back to your pet. Have you used Nina Ottosson Dog Treat Maze before? Let us know what you think about this product. In less than a minute my yorkipoo had got hold of this and could carry it by the part that dispenses the treats. His teeth immediately damaged the opening so now each time I introduce it, he doesn't even look for treats, just tries to chew it. No good for my dog at all. Good fun, my pup loves flipping it about to get his treats out. Bought this toy for my Springer Spaniel pup to help keep him mentally stimulated. He loves this toy. Quite a robust toy but saying that the blue outer rim has slightly been chewed and is not seating flush to the rest of the rim. Would buy again. Purchase and delivery no problems. Delivered on time. Will use this company again. Can recommend no probs. Great product. Keeps dog amused for ages.